Tick bites are normally of minor consequence; however, ticks are important vectors. Ambylomma sp. 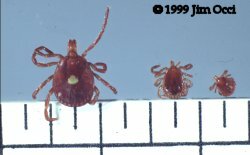 are hard ticks and can transmit the agent of Rocky Mountain spotted fever. A. americanum is shown at right (female, male, and nymph).